Contextualizing KPIs is a must. 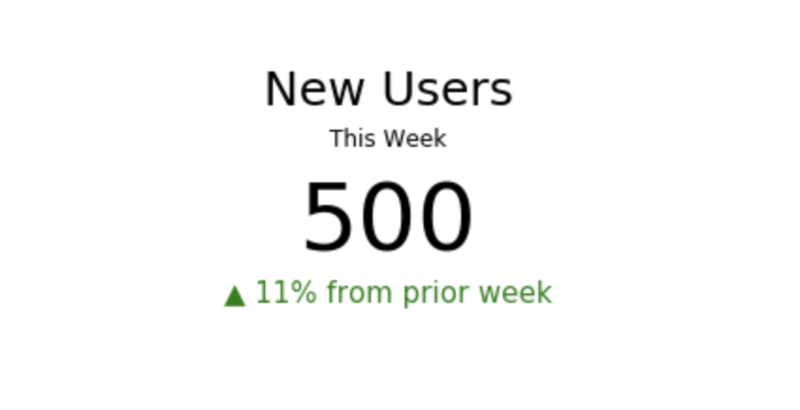 For instance, if a company has 500 users, how does that compare to the number of users last week? Using Periscope Data's Python Integration, we can create customized number overlays to cleanly present this information. Then, we apply the following Python 3.6 code on the SQL output. Here we are also adding some helpful text to describe the KPI and adding some arrows and coloring to contextualize the KPI. How does your business like to format KPIs in Number Overlays? Comment below! Timely solution, I was just looking for a solution like this. Hopefully it gets added to the standard overlay. What are you using to return the arrow? I can make something similar symbol using unicode. Works fine for me, just wondering if there was another way. Thank you Neha Kumar , this is really useful. A question: How do you control the whitespace around the plot when it renders on the dashboard? I can create a plot that looks good in the 'edit' screen, but shrinks a lot when it appears on the dashboard. Conor OKane Great question, you may need to resize/scale the figure in that case. Details on how to do that here, let me know if that works for you!